NATURE’s Encountering Sea Monsters follows Bob Cranston in his quest to film and understand the world’s most mysterious cephalopods. Imagine coming face to face with a cannibalistic creature that is as tall as you are and has long tentacles, a razor-sharp beak, and skin that flashes with bizarre, dazzling color. NATURE’s Encountering Sea Monsters does just that, as underwater cameraman Bob Cranston explores the remarkable world of marine creatures called cephalopods. 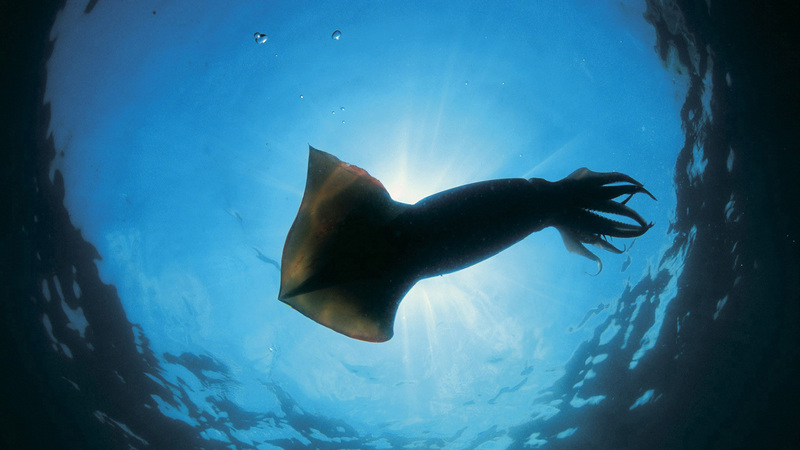 Cephalopods include squids, cuttlefish, octopi, and nautili. Cranston and top marine scientists dive in waters from Indonesia and Mexico to Australia and Texas, meeting up with a variety of cephalopods — from the tiny but deadly blue-ringed octopus to the giant Humboldt squid, known for its aggressive behavior, flashing light shows, and cannibalism. Join Bob Cranston as he fearlessly reaches out and interacts with some of the ocean’s most fascinating life forms. A Production of Thirteen/WNET New York and National Geographic Inc. Photos for "First Glimpses of the Giant Squid" and "Dancing with Devils" © Brian J. Skerry. Photo for "Introduction" © George Grall. Photo of blue-ringed octopus for "Interview: Dr. Mark Norman" © Gary Bell/PictureQuest. Other images from Encountering Sea Monsters.